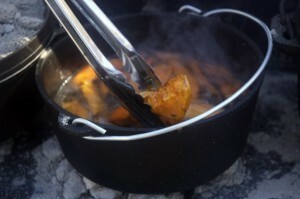 The following recipe uses a Dutch Oven, but can be adapted for other cooking methods. Place a bed of coals under a 12" dutch oven. Bring to boil and then simmer 15 min. Add potato wedges and cook until they become tender, but not soft. Remove from syrup and allow to cool while syrup simmers and thickens. 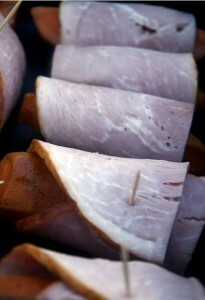 Wrap cooled wedges in ham slices and secure with toothpick. Add butter to the syrup and return potatoes and ham to the pot. 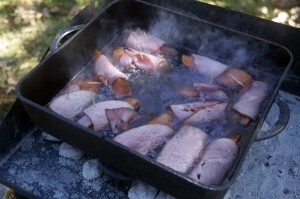 Continue to simmer for 15 to 20 minutes, until ham and potatoes are heated through. 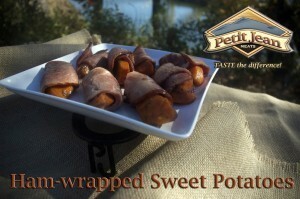 Serve with Peppered Bacon-wrapped Turkey. 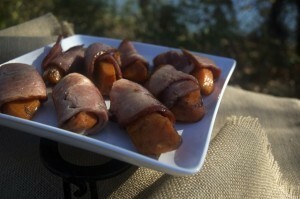 Special thanks so the River Valley Black Pot Cookers for sharing this recipe.